The official beginning of the Egyptian art movement was 1908, with the opening of the first School of Fine Arts in Cairo. The work of all of these first-generation artists demonstrate a strong Egyptian character and a departure from the norms of European-style academic art prevalent at the time, to a pre-Islamic and pre-Christian past by the adoption of neo-pharaonic motifs on the one hand, and more focus on the spirituality of the common man on the other hand. The artist I am introducing here, Abdel Hadi Al Gazar belonged to the third generation of artists. Following the end of the Second World War, Egyptian art saw something of a revival by this third generation of Egyptian pioneer artists. At its outset this generation’s feeling was that the purpose of art was to move beyond figurative representation and formalist abstraction and instead to express profound and universal concepts. There are three strands of this generation, First: a formalist approach, which embraced new trends in modern art, some of them Western. Second: metaphysical tendencies, expressed by depictions of figures in primitive settings, which evoked a yearning to rediscover nature, stylistically with ties to Surrealism. The third strand was formed by number of artists who founded what they called the Group of Contemporary Art. They were seeking to move away from metaphysical and surrealist sympathies towards a synthesis of folk art, and to forcefully depict the lives of miserable and oppressed masses. Those artists spoke of the tough times, which followed the end of the Second World War, when Egypt experienced a recession such as it, had never seen. With an exploding population and mass unemployment, a large part of society, rooted in a deeply superstitious folk culture, was dipping below the poverty line. Abdel Hadi Al Gazzar (1925 – 1966, Alexandria, Egypt) occupies a unique position among the artists of his generation. Gazzar was a member of the Group of Contemporary Art mentioned above. There is an argument that Gazar was more of an expressionist than surrealist, though he’s often described as one. He is more attached to reality than to the products of the unconscious, visions of the imagination and dreams. However, there are definitely surreal elements in Gazar’s work. Like surrealists, Gazar did not naively accept that everything is in its logical place at the level of pure reality claim. The first phase is the metaphysical stage and is reflected in Gazar’s work between 1938 and 1946. Gazar who was born in a Mediterranean city (Alexandria) translated his interaction with the abstract environment around him, and he was convinced that all creatures originate from one source (water). In this stage (also, historians call it the Shells Period), and based on the anthropological theme of man before civilization and his relationship with the wilderness, Gazar used shells as icons to express his ideas and feelings about sources of life. The second phase of El-Gazzar's career reflected his move to and influence by Sayeda Zeinab, a Cairene historical popular district. In this district medieval traditions resisted all the winds of modern westernization. It was in this district that he witnessed the moulids (Sufis carnivals) and the religious festivals that have been celebrated since the Fatmid period. He began to associate the intuitive aspect of art (its soul) with the essential element in the popular magical art (the hidden and the unknown). The third phase of El-Gazzar's later works were very different, influenced as he was by the politics of contemporary Egypt (1952 revolution) and with a focus on technology and progress (With the rise of the socialist state of 1952s and 1960s). A period of study in Italy and England (1956-1958) saw major stylistic changes in his work, namely a marked tendency towards abstraction. This later work shows him to have been both fascinated and repelled by scientific progress and the interaction (or lack thereof) between man and machine. He moved away from the irrationalism of folklore towards a surrealism that resembled ever more closely science fiction. This was really an extraordinary thing for an Egyptian artist of the time to do -amongst his contemporaries there were no parallels. this is my favorite. It is called Abou El Sebaa which means The Father of the lions. I like the adoption of folkloric motifs and pharaonic affects with the usage of hot colors. This is the most famous work by Gazar. It is called High Dam. This work reflects man-nature-machine interaction so vivid in the project of the high dam with surrealist elements and touches. “The Kiss” is his best-known work, which was completed in 1907-1908. The painting is on a square canvas with oil paint and layers of gold leaf applied on top. "The Kiss" is a symbol of the Viennese Art Nouveau, which was a movement inspired by natural forms and curves. The painting is intriguing in that the female is not merely the object of affection, but she serves as the main focal point. 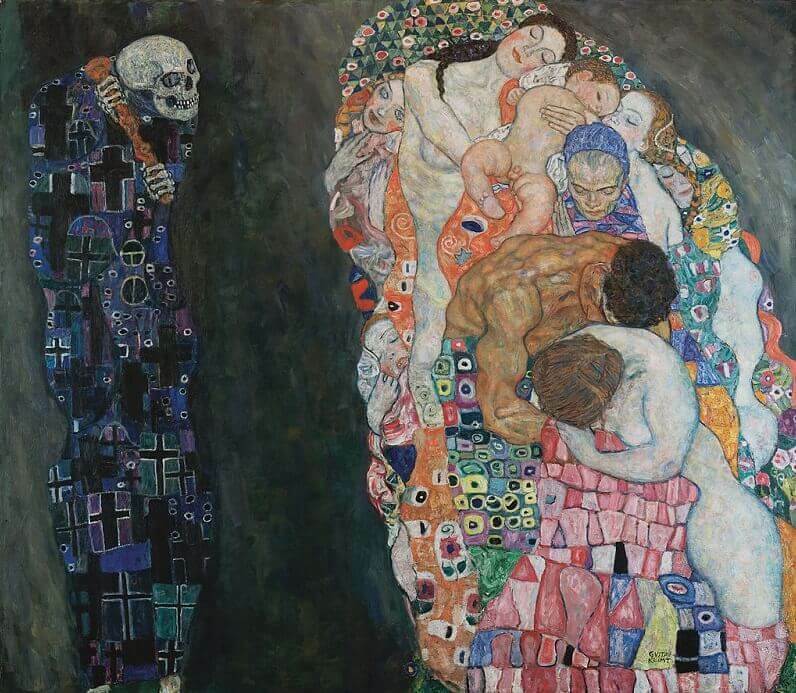 This painting titled "Death and Life" was completed in 1908 and won first place at the 1911 world exhibition in Rome. To the left, death is depicted as the stereotypical grim reaper, covered in a cloth of symbols. Life is symbolized on the right, with figures drawn from various phases of life. It is also covered with a robe of symbols, but the color scheme differs drastically from that of the left. This drawing drastically differs from what Klimt is most known for, his magnetic golden paintings. It is titled "Fishblood" and was created in 1898 through the use of pencil, ink, and black and white chalk. This drawing illustrates exquisitely both structure and fluidity. This sketch is from the series "Impurity" during the "Beethoven frieze." A common theme of this sketch and his other paintings is the subtlety of emotion that is conveyed.